Ebsqart.com is having its 9th annual ripped off show for member artists. This year I partnered with three fellow ebsq artists. The idea is you search your partner’s portfolios and they search yours; then, you each choose a piece to rip off. The key to this is you really have to love your partner’s work. This year I was very blessed in that department. All three of my partners have a wonderful whimsical quality to their work that I find inspirational. An added bonus is that we all trade our pieces. So, I get to add a piece of artwork from some of my favorite artists to my own personal collection. Here are the three pieces that I mailed to their new homes yesterday. All cats. I wonder if that means anything. 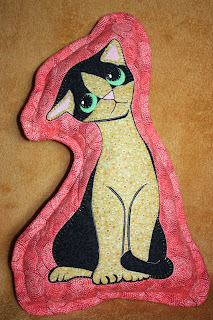 My rip of a Sara Field piece is a fabric appliqué, quilted pillow stuffy. I have been a big fan of Sara Field ever since I found one of her Klimt pieces on eBay. I hope my rip does her work justice. My rip for Elizabeth VanSickle is what I like to call a stuffed painting, all hand painted on muslin and stuffed. I really enjoyed creating this piece for Beth and wish her the best in health and happiness. I really love the Geisha she did for me! She is a very talented artist and I find her work especially inspiring. 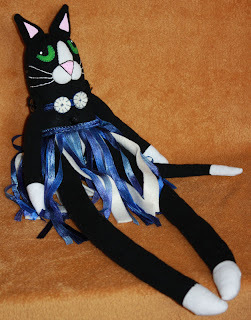 My rip of S. Olga Linville is one of my non-traditional sock dollys. 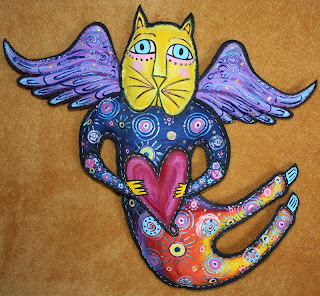 For a long time, I have been attracted to S. Olga Linville’s whimsical cat art. She is such a talented artist. I hope she enjoys her new doll. 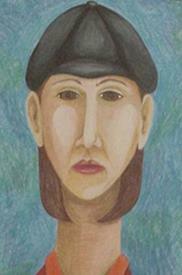 Several years ago, while searching art books for lessons to teach, I chanced on the portraits of Amadeo Modigliani. As a result I did the first self portrait I have ever attempted in my many years of artistic experimentation. I chose Prismacolor colored pencils as my medium. Honestly, what is less intimidating than coloring. A colored pencil is simply a skinny crayon encased in wood. Plus, crayons are fun. 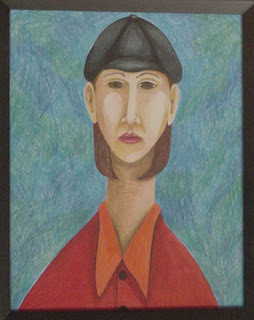 Modigliani’s style of elongating his subjects tempted me at last to do this portrait of myself. What could be more appealing to a petite, slightly round middle aged woman. The thing I like best about this piece is the instantaneous weight loss of the subject (me) when viewed through the perceived eyes of Modi. Awesome! Much better than fasting. I am a Mississippi magnolia uprooted at the height of my youth from my native soil and transplanted to the red clay hills of North Carolina, where my blossom is now gone and my foliage is sadly withering.